[BENJAMIN FRANKLIN]. Newspaper. 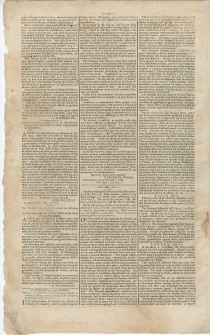 Gazette of the United States. November 25, 1789, New York, N.Y., 4 pp., (pp. 257-60), 10 x 16 in. “Slavery is such an atrocious debasement of human nature that its very extirpation if not performed with solicitous care may sometimes open a source of serious evils.....The unhappy man who has long been treated as a brute animal too frequently sinks beneath the common standard of the human species. The galling chains that bind his bode do also fetter his intellectual faculties and impair the social affections of the heart. Accustomed to move like a mere machine, by the will of a master, reflection is suspended: he has not the power of choice… Attention to emancipated black people, it is therefore to be hoped, will become a branch of our national police; but as far as we contribute to promote this emancipation, so far that attention is evidently a serious duty, incumbent on us, and which we mean to to discharge to the best of our judgment and abilities… A plan so extensive cannot be carried into execution, without considerable pecuniary resources, beyond the present ordinary funds of the society…” (issued Nov. 9). … I fear, Gentlemen, your goodness has led you to form too exalted an opinion of my virtues and merits—If such talents as I possess have been called into action by great events, and those events have terminated happily for our country, the glory should be ascribed to the manifest interposition of an over-ruling Providence. My military services have been abundantly recompensed by the flattering approbation of a grateful people; and, if a faithful discharge of my civil duties can ensure a like reward, I shall feel myself richly compensated for any personal sacrifice I may have made by engaging again in public life. 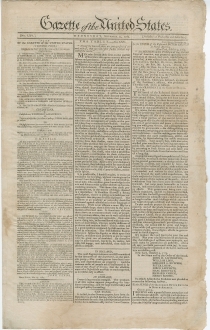 The Citizens of the United States of America have given as signal a proof of their wisdom and virtue in framing and adopting a constitution of government, without bloodshed or the intervention of force, as they, upon a former occasion, exhibited to the world of their valor, fortitude, and perseverance; and it must be a pleasing circumstance to every friend of good order and social happiness to find that our new government is gaining strength and respectability among the citizens of this country in proportion as it’s operations are known, and its effects felt. 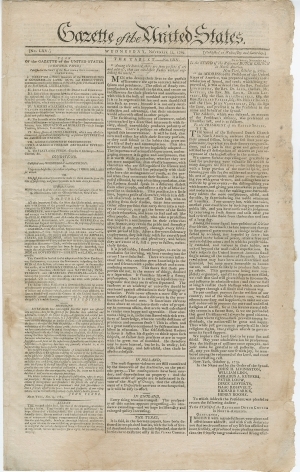 You, Gentlemen, act the part of pious Christians and good citizens by your prayers and exertions to preserve that harmony and good will towards men which must be the basis of every political establishment; and I readily join with you that “while just government protects all in their religious rights, true religion affords to government its surest support.”… (Front page, right column; and 2nd page, left col). “that great and glorious Being, who is the beneficent author of all the good that was, that is, or that will be, for his kind care and protection of the people of this country previous to their becoming a nation--for the signal and manifold mercies, and the favorable interpositions of his Providence which we experienced in the course and conclusion of the late war--for the great degree of union, tranquility, and plenty, which we have since enjoyed--for the peaceable and rational manner, in which we have been enabled to establish constitutions of government for our safety and happiness, and particularly the national one now lately instituted--for the civil and religious liberty with which we are blessed; and the means we have of acquiring and diffusing useful knowledge; and in general for all the great and various favors which he hath been pleased to confer upon us.” (p. 3, col. 3). With a report from Paris about the deadly Women’s March on Versailles, one of the first moments of the French Revolution, on part with the importance of the storming of the Bastille. On October 5, demonstrations about the price and scarcity of bread coalesced into a mob. With Lafayette in command of “50 Parisian troops and mob were killed and thirty of the King’s guards were cut to pieces…” (p. 2, col. 3-p. 3, col. 1). “For the last 24 hours the King has not eaten an ounce of food, and great apprehensions are entertained that his health is in great danger, to say no more.” Lafayette’s intervention saved the monarchs at that moment, but not for long. Coverage of the French Revolution includes “…Orders are given for using the utmost severity against the distributors of seditious papers. The heralds have proclaimed publicly in Paris a prohibition against mobs, and have authorized the military to disperse them.” (p258, right col, dateline “Oct. 12”). And a few pithy remarks on taxation which advocates Federal assumption of state debt, and comments in part “This fluctuating state of the tax laws became a temptation for particular persons to favor themselves; and jealousy has been gradually introduced between respectable classes of citizens, whose property is in difficult situations…” (p259, middle col). (p. 3, col. 1). And parts of Alexander Hamilton’s plan for assuming state debts, a list of past payments by the Treasury, and numerous acts of Congress including “An Act Making Appropriations for the Service of the Present Year” ($639,000), and “An Act providing for the Payment of Invalid Pensioners of the United States.” (Both signed into law by George Washington on Sep. 29, 1789, 4th page, middle col).